After the Fall of Saigon on April 30th, 1975, every South Vietnamese man, from former officers in the armed forces, to religious leaders, to employees of the Americans or the old government, were told to report to a re-education camp to “learn about the ways of the new government.” Many South Vietnamese men chose to flee on boats, but others had established lives and loved ones in Vietnam, so they willingly entered these camps in hopes of quickly reconciling with the new government and continuing their lives peacefully. According to my father, the government said re-education would only last for ten days, and at most two weeks. However, once there, the men were detained for many years in grueling labor camps. Many people couldn’t take the inhumane camp conditions and hoarded their rice rations and attempted to flee at night. Unfortunately, communist guards usually caught prisoners as they climbed the fence that surrounded the camps. “I never tried to leave. I had friends who tried to escape, who were shot dead.” If they survived, the punishment was severe. Five to six soldiers beat prisoners who were brought back. “I had a friend who was beaten until he vomited blood… (there were) welts all over his body.” Afterwards, guards jailed him in a small box for three to four months. “My friend went through that and survived. During the war, he served as a Vietnamese SEAL, so he was very strong. That’s how he withstood the camp conditions. He lives in the US today.” My father continues to correspond with his friend through letters and more recently, e-mail. Prisoners learned to be resourceful with the few items they owned. “In the North, all the clothing I wore had holes, so I had to make my own needle and smuggle thread to mend them.” Each year, Communists only issued one shirt and one pair of pants. “I had to get pieces of cloth to sew another layer of clothing, or even underwear.” Most of his clothes were from 1975, when he initially thought he’d be in camp for only ten days, or sent from his wife and her mother. Besides interaction with the locals, my father remembers simple pleasures. “What was best for everyone was the chance to bathe, because we were so dirty. Everyone desired to bathe. Afterwards, we’d take our clothing and wash it in the water.” Reflecting back on how they walked back to camp, dripping wet, he feels lucky that he never caught pneumonia. By the time my father was released in 1982, my mother’s entire family had fled to America. Left in Vietnam, my mother gave birth to me in 1983, and my brother Quang in 1986. My parents raised us in Saigon. In 1990, my grandmother was able to sponsor our family to come to America. The first years in the U.S. were difficult. My parents juggled learning a new language, attending English classes and technical school while working part-time jobs to support my brother and me. Fortunately, we had the support of my grandmother and our extended family. For the first three years, we lived with my aunt Thuy. After graduating from technical school, my father quickly found a job as a machinist at Masterson’s Manufacturing company. Here, his workmanship and attention to detail, as well as his gregarious nature made him a favored employee. Meanwhile, my mother worked part-time at Stop & Shop and pursued additional schooling to expand her opportunities. In 1993, the family saved enough to buy a small house in West Hartford, CT.
Today, my father continues to work at Masterson’s and enjoys gardening and reading in his spare time. My mother is working towards a nursing degree, and my brother Quang studies International Relations and Philosophy at Boston University. I graduate from Brown University in May 2005 with a degree in Visual Arts. During he days, the bulk of the labor involved carrying materials from the jungles, or clearing bamboos to create spaces in which to build. This painting is about the monotony and rigorous nature of the work. Mentally dull and physically draining, a lot of men lost their will to live in the arduous work of the jungle. Others found strength and humor in each other as they performed the repetitive tasks. I like to imagine my father and his friends found comfort in the resilient nature of the bamboos, and that the trees shielded them from the harsh sun and embraced them in the cool soft heart of the jungle. When I was young, my father frequently reminded my brother and me to enjoy the plentiful food which my mother cooked. To help convince us, he regaled us with stories about how he starved, eating only a small handful of rice a day during his time in re-education camps. I failed to appreciate the reality that my father lived through until my college years. Now, after learning about hunger in the United States, volunteering at soup kitchens and in Providence pantries, and realizing the importance of food, I marvel at how he was able to survive the hard labor on such paucity. This painting portrays a cocky young Communist guard who watches the prisoners as they scrounged for food. 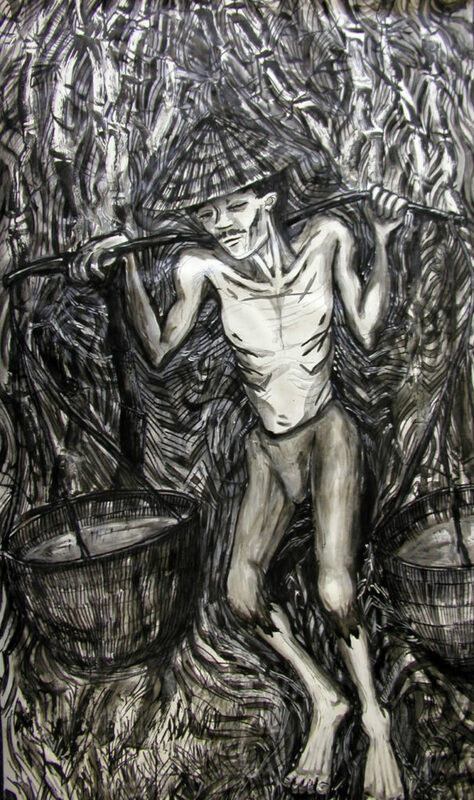 The scarcity of rice and protein for prisoners forced men to find nourishment from local flora and fauna. My father remembers eating everything from snakes to salamanders. When my father told me about living conditions, he said one phrase which seared an image into my mind. Trying to describe the squalor and lack of space, he explained, “we had to lie like canned sardines.” This is the inspiration for the painting. After my initial drawing, which I showed to my father, I made a few changes to ensure the accuracy of the image. He described two rows of starving, uncomfortable, sick men who lay side by side on wooden planks, and in between the rows, a dirt walkway lead to the entrance. 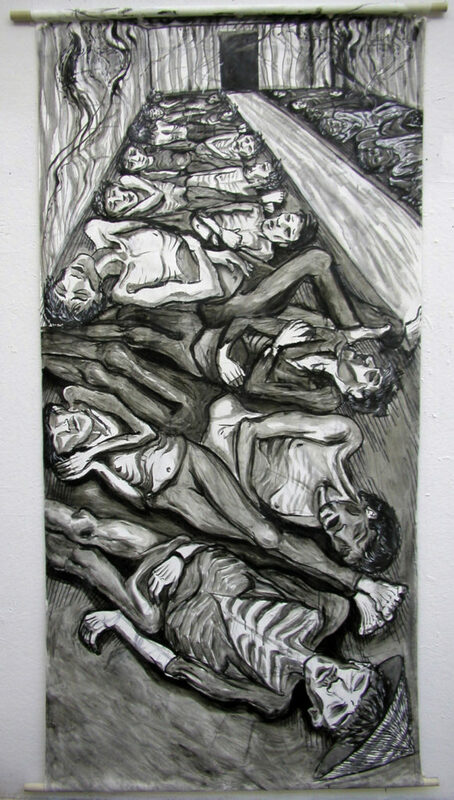 To create the fevered, haunting atmosphere, I looked at images of the Holocaust and perused German expressionist Kathe Kollwitz’s drawings and prints. One of the most humiliating and dehumanizing experiences for my father was being ordered around and beaten by a teenage officer. The Vietnamese tradition of respect for one’s elders is completely subverted, even as the re-education camp claims to educate the prisoners into better citizens for the new regime. Despite the painful beatings, meant to degrade the men and crush their spirits, many re-education camp prisoners supported each other through the punishments, finding hope in each person’s survival. Aside from human-inflicted punishment, re-education camp prisoners faced malnourishment, heat-stroke, infectious diseases, malaria, and dysentery, among other traumas. Even though the population of these labor-intensive camps was diverse—everyone from South Vietnamese doctors to soldiers were forced to endure re-education—the men found community in each other. My father recounted many tales of how he survived because another prisoner looked after him, or found him when he was injured and sick in the jungle. Throughout the gloom of sickness and feverish nightmares, these men tried their best to ensure each other’s survival. images of ghostly spirits and watchful eyes are integrated into the painting to emphasize the conflicting senses and the fevered thoughts of the sick man portrayed. In Spring 2003, I was inspired by Beth Taylor’s Writing the Southeast Asian War class to interview my parents and learn from their experiences. Growing up, I had always heard snippets of war stories and camp details from my father, especially at dinner time when he would encourage me to appreciate my food by regaling me with stories about hunger pangs. However, I never heard the complete story until that spring, when we sat down with a tape recorder and discussed in detail the seven unaccounted years of his life. I was stunned, touched, overwhelmed by what I heard. Writing the oral history helped me better understand better his experiences, but I needed to create something else to truly appreciate and process the stories. Struck by certain images my father evoked in retelling his stories, like “canned sardines,” and inspired by anecdotes about hunger, work, and camaraderie in the jungles, I made five pen and ink drawings, illustrating the experiences as I imagined them. Even though they are complete drawings in themselves, these drawings continued to haunt me. 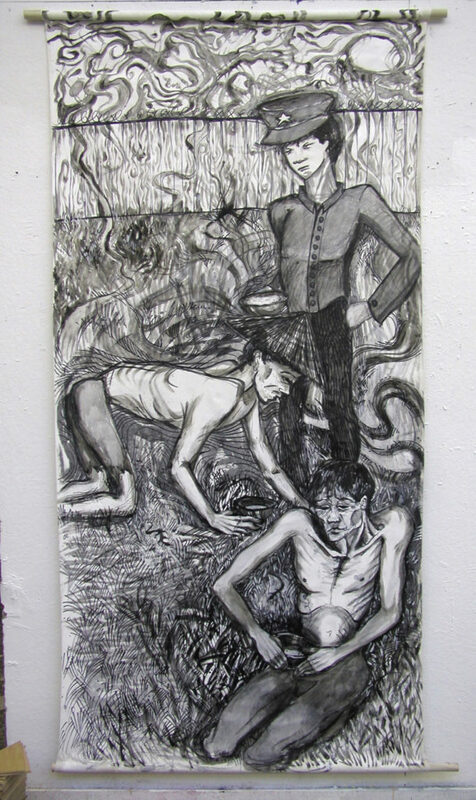 During my third year at Brown, I realized I wanted to create larger paintings, to interview more Vietnamese re-education camp survivors, and to exhibit these stories on a wider scale. In Fall 2005, I took Jim Blight and janet Lang’s Vietnam War Re-Visited class, which helped me revisit ideas from my sophomore year and carry my Viet Nam Re-education Camp project to another stage. The class taught me a lot about external U.S. forces that influenced the escalation of the Vietnam War, and impressed upon me the importance of discussing my father’s experiences to provide a fuller picture of unforeseen war consequences. I had a series of meetings with Jim to discuss possibilities for exhibiting the paintings, and agreed to create them for my final class project. In addition to in-class and out-of-class discussions, Jim, janet and I made a trip to Newport to check out Roger LeBrun’s photography exhibit. Roger captured compelling images from orphanages on the fringe of the Vietnam War, showing glimpses of happiness, hope and life amidst a violent, deadly and rapidly degenerating civil conflict. Conversations with Jim and viewing Roger’s photos made me reconsider my sketches—I wanted to paint moments of humanity shining like gems in the dark depths of despair, show camaraderie and compassion glowing in the gloom of the worst conditions. Therefore, although the paintings are inspired by the drawings, they are original pieces. I chose to use black ink, charcoal, and oils in blended harmony to limit my palette, to show the stark situations without interference from associations that come with color. Painting on gessoed light muslin, I got the effect of working on rice paper and was able to roll the canvas into scrolls, which is an appropriate format for the subject matter. The style of the paintings are meant to allude to ghosts, spirits and hallucinations, and are influenced by German expressionists as well as photographs and artwork from the Holocaust. 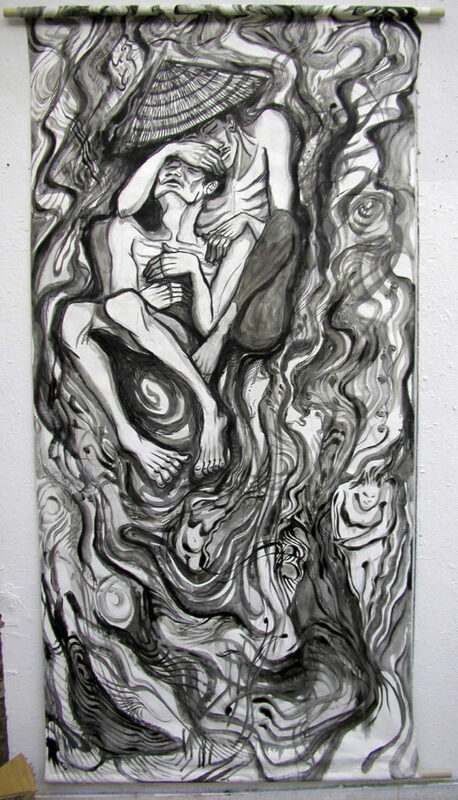 In particular, I was inspired by Scandinavian artist Edvard Munch and German artist Kathe Kollwitz. What you see is the result of several years of asking questions, reflecting, and transforming ideas into reality with the endless support of professors, friends and family. My intentions for creating these paintings is not to horrify anyone, or remind ourselves of atrocities we can commit upon each other. Rather, these paintings are meant to honor my father’s experiences and those of the men who suffered alongside him. Furthermore, these paintings are a testament to these men’s strength and courage in the face of devastating conditions. The Vietnamese have deep beliefs in ancestral worship, Buddhist notions of karma, and superstitions. 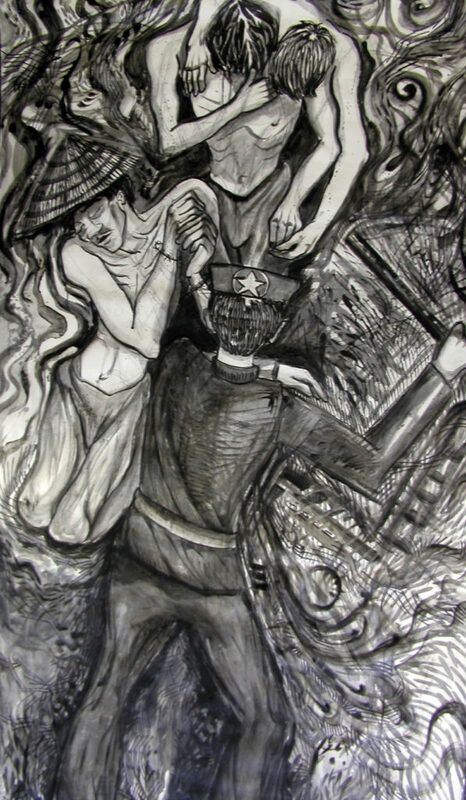 In the scroll-like paintings, my intention is to evoke the spirits of the Vietnamese people who have survived and transcended these re-education camps. Moreover, I want the work to pulsate with life and with the daily struggles of re-education camp detainees. Despite the many instances of inhumanity portrayed in these works, there was also a lot of humanity shared among the prisoners as they supported each other in their quest for survival. The men who suffered through the worst of the corporal punishments still had a lot of life left in them to persevere, leave the camps, and create lives anew both in Viet Nam and in the United States. Unfortunately, many of these re-education camp survivors have been unable to speak about their experiences, and their stories are left unheard. These paintings are meant to evoke the stories we all carry within, so that we can celebrate our lives and those that came before us.